Tables in Sql Server stores data in the form of Rows and columns. Below is the basic syntax for a creating Table in Sql Server. Let us create a simple Customer table with three columns CustomerId, Name and PhoneNumber. Here CustomerId and Name columns have NOT NULL constraint, which enforces that each row in this table needs to have a value for this column. Where as PhoneNUmber Column in this table is optional, it allows NULL values for this column. By default if we don’t specify the NOT NULL constraint for column during table creation, then it is considered as Null-able column. DEMO 1: Adding records to the Customer Table with all the column values. Let us verify the Customer Table Data. DEMO 2: Insert without Optional column PhoneNumber value. DEMO 3: Sql Server will raise an exception if we don’t pass NOT NULL column value. Cannot insert the value NULL into column ‘CustomerId’, table ‘SqlHintsTableTutorial.dbo.Customer’; column does not allow nulls. INSERT fails. DEMO 1: Add One more column DateOfBirth to the Customer table created above. DEMO 3: Try to add a NOT NULL column City to the Customer Table having four rows. 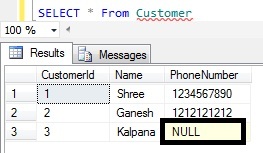 ALTER TABLE only allows columns to be added that can contain nulls, or have a DEFAULT definition specified, or the column being added is an identity or timestamp column, or alternatively if none of the previous conditions are satisfied the table must be empty to allow addition of this column. Column ‘CITY’ cannot be added to non-empty table ‘Customer’ because it does not satisfy these conditions. DEMO 2: Try to access a Table which is Dropped.